We arrived back in our neighborhood at 20:30 and it was prime time for dining on a Saturday evening; we knew it would be difficult to secure a table. The first two places we tried were fully booked. Fortunately Au Tibourg, 29, rue du Bourg-Tibourg, 75004, 01-42-74-45-25, had a table for two in the non-smoking room. (We found that many establishments have non-smoking areas or are at least willing to cooperate by putting non-smokers together.) This restaurant had not made our "suggested list" but we do recommend that it make yours. The environment is country intimate with no shortage of wood beams and exposed stone and brick. The service was cheerful and attentive. It felt good sitting in a comfortable room, sipping a delicious house red, inhaling the aroma of the dishes being served and listening to the melodic French chatter of the local clientele. Linda was still digesting her late afternoon sundae and opted for only a light, Nicoise-style vegetable cake on crushed tomato and fresh basil. Not at all suffering from lack of appetite, I started with a salad of lamb lettuce and beetroot with a slice of duck liver pate; a traditional dish of roasted lamb shank and kidney beans was a hearty main course. Every preparation was superb; it was a very well-priced meal at 255FF. It was a dull, rainy Sunday morning, ideal for sleeping late and then a leisurely breakfast in the hotel. With our jet lag now gone, we were looking forward to the exciting plans we had on tap; tonight we'd start on a gastronomic treasure hunt and tomorrow would be the first of several very special meetings with friends old and new. The cozy breakfast room in the basement of the hotel with floral print table cloths and chairs would brighten any day. The always-happy staff is there to greet you and serve a healthy breakfast of fresh orange juice, bread, rolls, jams, yogurt, ripe kiwi and hot, delicious coffee. Newspapers, magazines and guide books are available. Most days we opted for a lighter breakfast by going north a few doors to 18 rue Vieille-du-Temple to Boulangerie Malineau where we'd select from the gorgeous assortment of breads and rolls, even managing to order the walnut and walnut/raisin rolls in French. These grainy beauties, chock full of raisins and walnuts with a crunchy crust, were heaven. After a few mornings, the sweet lady behind the counter welcomed us as regulars; she did not speak English but Bon Jour and a smile goes a long way. Treasures in hand, we would cross the street to the Columbus Cafe and take their delicious coffee upstairs to enjoy with our breakfast breads at a table overlooking the street. Ah, so you're curious about our gastronomic treasure hunt! Let the eating begin! Chez Janou, 2 rue Roger-Verlomme, 75003, 01-42-72-28-41, is a bistro specializing in Provencal recipes. But it is more, as Jami told us, because the owner, Jeff, loves his restaurant, the neighborhood and his customers. Located on a corner, the awning-covered outdoor patio welcomes you inside to the friendly bar and homespun interior, with framed photos and posters adorning the walls. Besides breakfast, lunch and dinner, you can drop in any time for a beverage and chat. It's pure neighborhood ambiance with a super caring owner and staff. The basic menu has many choices and there are three daily starters and main courses from which to choose. Linda had the daily main, bouillabaisse, a thick, hearty seafood broth with large pieces of delicious fish. My carpaccio de thon starter was incredibly delicious; thin slices of sushi-quality tuna rested on a sauce of balsamic vinegar and honey with shavings of shallot - simply sensational. The Magret de Canard au Romarin, slices of duck breast served perfectly rare with a delicate fruit sauce, came with piping hot mashed potatoes, with only a hint of butter so as not to detract from the taste and feel of real. Dinner, including a glass of excellent house red from Provence, was a very good value at 264FF. We had the pleasure of chatting with Jeff, who insisted that we sample two delicious liqueurs - melon and thyme. He also introduced us to the most wonderful nougat we had ever tasted, which is made somewhere in Provence by Andre Boyer. Jeff was also kind enough to recommend restaurants in the area, one of which was Cave Saint Gilles - our next clue. We made dinner reservations for a few nights later and as it turned out, it was the culmination of a most stimulating day. We started in Le Village St. Paul, located in the 4th arrondissement between rue St. Paul and rue Charlemagne, a quaint village of old structures with alleyways and courtyards. Antique dealers sell their wares in tiny shops and outdoors, weather permitting. Browsing through, we found many interesting but expensive items. The Hotel de Sens, at 1 rue de Figuier, which now houses the Bibliotheque Forney is a magnificent stone structure with stunning turrets and leaded windows. It sits on the right bank of the Seine surrounded by lovely residences with beautiful courtyards. Due east is the Port de Plaisance de Paris Arsenal bordered by Boul. Bourdon and Boul. 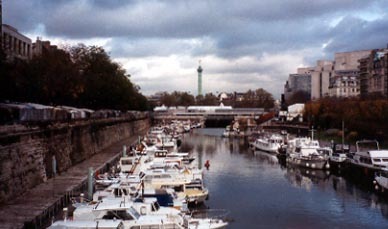 de la Bastille. The picturesque port was lined with moored pleasure crafts while an antique and used furniture and accessories show was in progress under tents in the area adjacent to the canal. Linda just loves this stuff and had a great old time while I pretended to be happy. 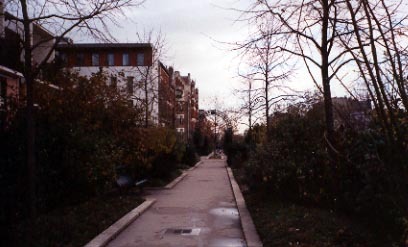 A few steps away along Avenue Daumesnil in the 12th arrondissement is a Paris treasure the Viaduc des Arts on top of which is La Promenade Plantee. But before we explored further, it was time for a light lunch. La Vannetiere, 55 Av. Ledru-Rollin, a creperie - saladerie was a perfect choice. Linda enjoyed her deep dish crepe of spinach, egg and emmenthal; if the spinach had been fresh, she would have loved it. My salad saumonette of greens, tomato, white asparagus, canned salmon, smoked salmon and boiled potato was very good. The portions were large and well worth the 120FF. The viaduct was originally used for train service. Rather than tear it down when the train became obsolete, it was transformed into a shopping center and promenade. The structure has high arches and is of striking red brick. Specialty stores are housed under the arches. We used one of the stairways that lead to the upper promenade and were blown away. A pathway down the middle is lined with lovely green plantings that even now in November were a sight to behold. As we walked along, there were great views down the cross streets and of the buildings alongside. It was a cool, overcast day but we were not alone. Folks of all ages were taking advantage of this gift, many of whom were young mothers with their kids in tow. There are stairways, elevators and ramps along the way and even a pond. 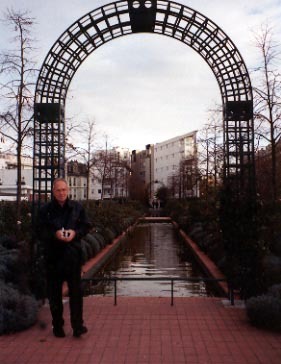 About halfway, we came to the beautiful Jardin Reully, which surrounds the Promenade. The garden is terraced down to street level with ample seating along the way for relaxation on a warmer day. There's lots of green space to stroll and play and some very pretty statues grace the area. We exited here and returned west on rue de Charenton, which leads directly to the Opera de Paris Bastille. As we got closer to the Opera, we found several of the other restaurants Jeff had recommended, which unfortunately will have to wait until next time. We turned right on rue D'Aligre to Place D'Aligre, home to a colorful flea and street market. The open air market was already closed for the day but the well-designed, enclosed market was still open so we browsed through the offerings in the small, enticing specialty stalls. The neighborhood is multi-ethnic, working class, immigrant. With time to spare before our 19:30 dinner reservation, we worked our way north along Av. Ledru-Rollin to Boul. Voltaire, home to wholesale/retail clothing outlets, packed to the ceiling with what appeared to be young, popular-priced fashion. As it was near dinner time, these two busy streets were filled with folks coming from work and dashing in and out of food stores. People just don't go to the supermarket and shop for the week as we do in North America. 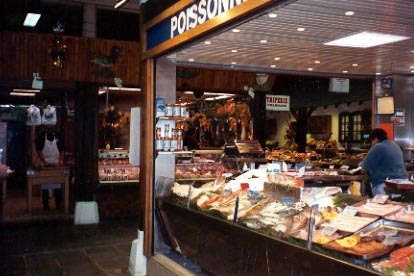 Instead they go from one specialty store to another buying the day's freshest product. The process starts in the mornings with the line-ups at the bakery. Caves Saint Gilles, 4 rue Saint Gilles, 75003, 01-48-87-22-62, is a Spanish restaurant with decor and environment to match. As at Chez Janou, the place was filled with locals all familiar to the jovial staff. The seating is rather tight and while we were trying to decide what to choose, the young woman seated next to Linda was served a gorgeous platter of grilled seafood - shrimp, sardines, calamari and lotte (tapas plancha). This was a no-brainer to share for our main course. We started with three tapas - cold mussels, fish soup and fish croquettes. Everything was fresh, well-prepared and presented. A pitcher of Sangria was the perfect accompaniment while the crème brûlée to finish was an excellent choice. We felt that the 350FF price for a seafood meal of this quality was very fair. Both Chez Janou and Cave Saint Gilles are just north of Place des Vosges and close-by to the Musee Picasso, Musee Carnavalet, Place Bastille and in the middle of a lively neighborhood worth exploring for the ambiance of nice, city living with the opportunity to mix culture and dining. Best of all, we had the pleasure of meeting and chatting with Jennifer, who designs accessories for Givenchy. Jennifer provided the next clue on our treasure hunt - La Boca. After a Spanish dinner and a morning doing laundry while catching-up at the Internet spot, conveniently near one another on rue du Roi de Sicile around the corner from our hotel, we are ready for a late Italian lunch at La Boca Ristorante, 59 rue Montmartre, 75002, 01-42-36-71-88. We arrived at 14:20 and it was almost completely full. We mentioned to our waiter and co-owner Rocco that Jennifer had recommended his restaurant. It turns out that he had been Jennifer's landlord not too long ago. The first floor, where we sat, exudes friendly, trattoria charm. We later found out there is a gorgeous dining room upstairs, but didn't get to see it. The short menu is on a blackboard and this day's offerings included a soup, five salads, three pastas and one meat. Usually fish is also offered but the delivery failed to arrive. Linda had buffalo mozzarella to start and I a salad with the same cheese plus lettuce, tomato, artichoke and anchovy. The portions were huge and we should have shared just one, particularly with the quantity of delicious olive bread we consumed. The large portions of ravioli stuffed with ricotta, spinach and Parmigiano in a rich cream sauce and penne arrabiata were as wonderful as the salads. Considering the size of the portions and the fine preparation, 265FF was reasonable - a fine value. We were on a roll. Seated beside us were Christina, Rizole and Emmanuelle, who worked in the area, which is home to much of the publishing and fashion business in the city. They confirmed that this is a very "in" place for those who live and work nearby. We enjoyed chatting with these delightful ladies, who soon provided the next clues for our gastronomical pursuit. Our list was now growing long enough for another 3-week visit! Their first recommendation confirmed one from our niece - 404 Restaurant Familial. There is a large North African population in Paris and consequently many excellent Moroccan restaurants. The cuisine is extremely popular and for good reason. As we were leaving, Rocco asked if we had been to Galerie Vivienne and Galerie Colbert, which were right around the corner on Petite-Place. We had not so he insisted on escorting us there as it was his favorite place in the city. In spite of the fact that he was heading home to his expectant wife, who was due momentarily, this incredibly sweet man insisted on pointing out the architectural beauty of Galerie Vivienne; the high arched dome ceiling, the splendid wood-framed store fronts, the black and white small stone designed floor - pure, old world Parisian sophistication. And as a special treat, he took us to the wine store, which has an entire window filled with wine bottles, each with a unique corkscrew protruding from its neck; what an amazing collection! But, best of all, Beaujolais-Nouveau had just arrived and they were offering free tasting. Did we hear free? Gallerie Colbert is home to Le Grand Colbert (the front entrance is at 2,4 rue Vivienne), the quintessential Paris brasserie. We had been planning to dine here so we took the opportunity to make a reservation for lunch on Sunday. The spectacular Place des Victoires, where rue Etienne Marcel and rue des Petite-Champs meet, is the center of the fashion/design area. Sophisticated retail fashion houses have located here while on the side streets and in the alleyways smaller boutiques and fashion shops have opened their doors. Paris is the fashion capital of the world but if that's the case, it must be avant garde to have the streets littered with doggy doo! Thank goodness for the men in green. The sanitation workers, dressed in green, with their green trucks became a familiar site as we walked the city. With the aid of a brilliant system of spigots that line the curbs, they wash and scrub the sidewalks around the clock. They collect the garbage regularly and it was amazing to watch an army of them descend on a street market at the end of the day and proceed to pick up all the litter and garbage and scrub the entire market area down with stiff brooms and high power water hoses. Despite the laziness of the Parisian dog owners, the green men manage to keep Paris so very clean. 404, at 69 rue des Gravilliers, 75003, 01-42-74-57-81, is pure Moroccan. From the lively, young staff to the fixtures, fabrics, artifacts and the aromas emanating from the open kitchen - it's a couscous and tajine paradise. The kitchen greets you as you enter with large bowls of spices, big pots on the stove and chefs cooking the couscous and working the grill. The low tables and chairs are tightly-packed for maximum seating and the low lighting and design create a mellow and romantic atmosphere. There are two seatings every evening at 20:00 and 22:30 and reservations are required. We opted for the former and by 20:10 every seat in the house was occupied and the place was humming with a young, professional clientele. Salade Mechovia consisted of peppers, tomatoes and garlic finely chopped and served with slices of tomato and meaty, tasty olives. Sardines farcies are sardines split open, dipped in a light batter, deep fried and covered with a puree of lemon, coriander, cumin and garlic. These were two perfect starters along with homemade bread and a super Moroccan red wine to set the stage for Linda's tajine de canard with apples, cinnamon and almonds and my couscous with brochette of lamb. When the top of the tajine was lifted, the aroma of the ingredients signaled the arrival of a culinary treat. Happily, the apple and cinnamon flavors permeated the tender duck meat. The couscous is served with a large bowl of cooked vegetables in broth to be ladled over the grain and the tender, deliciously spiced and grilled pieces of lamb. The portions are very large - but too good to leave a drop. It was a delightful two and a half hours for 400FF. We were sitting at the end of a line of tables and were unable to converse with the only couple sitting next to us as they only had eyes for each other - so our string of recommendations from locals we ate with ran out; it had been a fabulous run - but we were far from done!